This entry was posted on Sunday, October 6th, 2013 at 8:00 am	and tagged with formulaic expressions, formulaic language, language learning, lexical approach, lexical chunks, memorization, phraseology, Spanish, vocabulary learning and posted in Uncategorized. You can follow any responses to this entry through the RSS 2.0 feed. Enjoying following you on this particular learning journey, Scott. I work for a publisher as you know, but hey, I don’t bear grudges when you throw in the regular references to us 🙂 Anyway, take this as a bit of peer-to-peer correction from another long-term native English speaker struggling to perfect his Spanish, but “no le caigo bien” is actually the opposite of what you suggest, and something more along the lines of “he doesn’t seem to like me”. (Thanks for the pointer to Anki, by the way. Looks well worth checking out). Michael Swan (2006), for example, argues that it might seem disappointing, but most non-native speakers must settle for the acquisition of a variety characterized by a relatively restricted inventory of high-priority formulaic sequences, a correspondingly high proportion of non-formulaic grammatically generated material, and an imperfect mastery of collocational and selectional restrictions. We cannot do anything about it, he argues, languages are difficult and cannot be learned perfectly. (http://bit.ly/K58nSK, section on Realism and Prioritising). 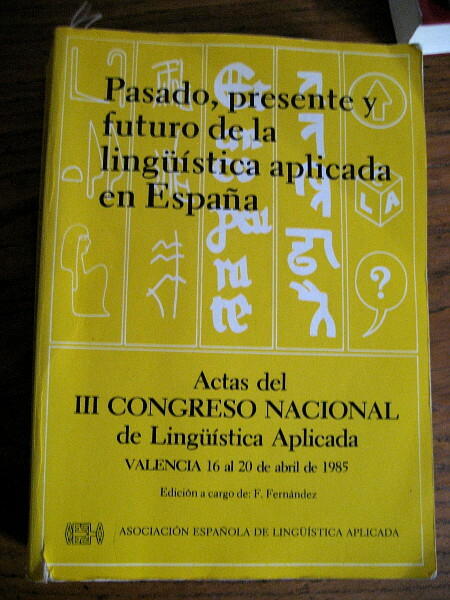 Much of the language we produce is formulaic, certainly; but the rest has to be assembled in accordance with the grammatical patterns of the language, many of which are too abstract to be easily generated by making small adjustments to memorised expressions or frames.If these patterns are not known, communication beyond the phrasebook level is not possible; as somebody memorably put it, language becomes “all chunks but no pineapple”. Grammar hasn’t gone away because we have rediscovered lexis. (In the collection of papers by Swan that OUP published last year (Thinking about Language Teaching) he kindly restores the attribution). It does seem that an exemplar-based approach offers a way forward, but that we can’t trust the learner to “abstract the patterns” unaided. That is to say, whereas in first language acquisition exemplars ‘release’ their grammar implicitly, in second language acquisition they may not — but simply remain as memorised chunks in a largely lexicalised competence. In his excellent book, Cognitive Linguistics and Language Teaching (Palgrave Macmillan 2009) Randal Holme dismisses the Lexical Approach for this very reason: “Students doubtless benefited from an enhanced repertoire of lexical phrases, but over-encouraged to seek the safety of the fixed forms, they still lost control of the larger meaning and found themselves stranded on phrasal islands of incongruous correctness by the error-infested nature of their larger sentence” (p.6). This is what I have referred to elsewhere as “all chunks and no pineapple”! 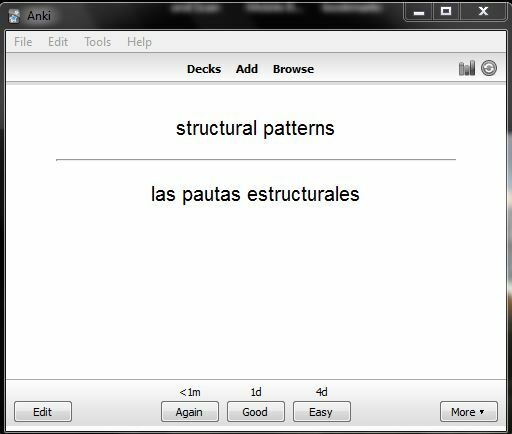 I find the anki cards are a good review tool but in order to get the words into your brain you really need to do a lot of work memorizing and using the phrases/ words initially to get them over from passive to active vocabulary. Have any of your books been translated into Spanish? Would your own thoughts and ideas already translated into native level Spanish not be the perfect learning tool to help you express the things that you want to say? I also noticed that you set up your cards to go from English to Spanish, I there any reason you chose not to do Spanish to English? 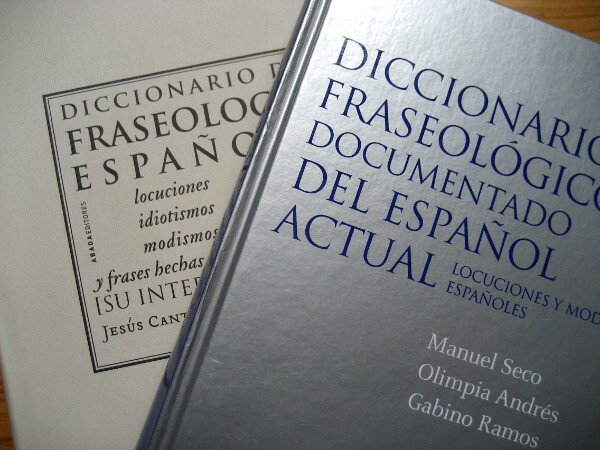 Or for that matter Spanish to Spanish ( definitions taken from Spanish dictionaries)? Hi Scott… yes, you’re right about doing the spade-work (and your comment more or less coincided with my response to Hana above). Finally, re the point about the direction of languages, yes, the beauty of the (physical) word cards is that you can use them in either direction (L1 – L2, or L2 – L1). I know you can do this with Anki too, but I have yet to find the tool that allows this. I can completely identify with this need for production in order to make things really stick. To develop my Spanish vocabulary I’ve been using http://www.memrise.com , which is bit like Anki but with the added bonus that many of the words and chunks are presented with mnemonics that other users have already keyed in. There is also the option of feeding in your own mnemonics for the words you are learning. We have a Spanish couple staying with us at the moment and the other day I wanted to tell them about leaving the windows open a bit during the day to stop mould building up on the walls. I knew I’d encountered the word for mould (moho) on Memrise and had successfully retrieved it many times but now when I actually needed it I couldn’t quite pluck it from memory. All I could remember was that it started with ‘M’ so I started saying the word and Joaquin understood what I meant and said the word himself. This necessity to use the word in context seems to have built up much stronger memory traces than decontextualised retrieval through memrise and I’m pretty sure I’d remember moho now if I needed it again. In a couple of weeks I’m going to be spending a week in an Arabic speaking country. This isn’t a language I know at all but I’m thinking of building up some high frequency key words and phrases through flash cards before I go, and then trying to throw myself into situations where I need to use them when I’m there. What do you think? I’m thinking of building up some high frequency key words and phrases through flash cards before I go, and then trying to throw myself into situations where I need to use them when I’m there. This sounds like an excellent strategy – but where will you access these words and phrases? Be warned that what is called Modern Standard Arabic (in textbooks, grammars etc) bears little relationship with what is spoken on ‘the Arab Street’. You’d be better off getting a phrasebook specific to the country you are going to, and using that as your flashcard source. I’ll be keen to know how you get on! Thanks for that tip Scott. I’ve got a fairly country specific phrasebook and am now in the process of picking out some key chunks to make flash cards with. I’m going to go for simple paper flash cards for the flexibility this provides in the when, where and how of the retrieval. I’ve been enjoying your blog and comparing degrees of fossilization. My experience of learning Spanish is quite different from yours. I came to Spain because I’d met my Spanish partner. He spoke no English and I spoke no Spanish – we communicated at first in French. After living 32 years in Spain (Seville) I’m very aware of the fact that I can communicate effectively – most of the time. But, as my Spanish is far from accurate, misunderstandings arise which actually cause communication to break down. Trying to remember verb endings is one of the main culprits (as far as I’m aware!) – hizo/ hice / fue / fui –Who the hell are we talking about? Why can’t we just use subject pronouns?? My first experiences of Spanish classes at the Seville University in 1980 were disastrous – apart from the teacher arriving 15 minutes late to every class and making the time up at the end of the class when I had to leave to teach – I was a total beginner and everyone else already spoke Spanish. But I do vaguely remember that the classes were based mainly on grammar exercises and asking my then boyfriend to explain the homework – subjunctives and imperatives –totally impenetrable. So zero to Seville University as far as language learning goes at this point. This is when I was also learning to be a teacher and stumbled upon Krashen – Yes, immersion can lead to language learning, of a kind. After being bored to …not to death, but yes, to falling asleep in get-togethers with groups of Spanish speakers and also hours of torture watching TV in Spanish (I would not recommend this method of language learning as I feel I may have been traumatized by watching endless episodes of ‘Hombre Rico Hombre Pobre’, ‘Penmarik’ and ‘Dallas’) I do distinctly remember that after about 6 months I could actually start to participate in conversations in Spanish – more on a one-to -one level than follow conversation in groups. Did immersion work? Did language acquisition happen? Yes, but my Spanish was extremely limited. In 1983 I once again started classes at the Instituto de idiomas of the Universidad de Sevilla. This time with greater success. There was a level test and I was in a group of students with a similar level. The teacher was great – friendly, approachable, punctual and he gave interesting and varied classes. 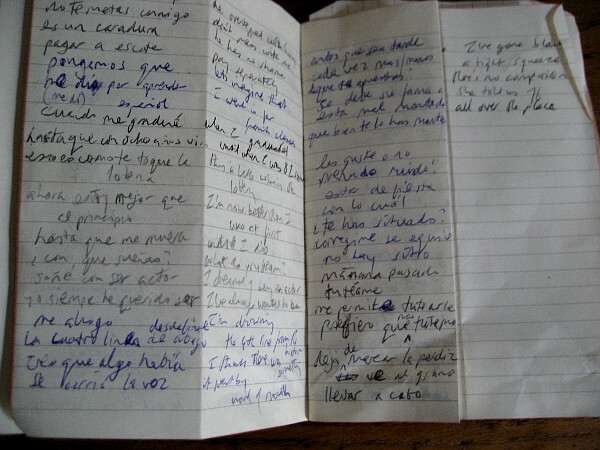 I have recently found my Spanish books and was amazed to see compositions with very few errors and high marks! Learning how to use the subjunctive was not the main objective of the course. Back to Krashen – I was never convinced by his theories – OK, being immersed in a new language did facilitate my language learning, but only at a very basic level. Do we become expert language users of our ‘mother tongue’ without a lot of reading, writing and effort to perfect our language abilities? Clearly we do not. I believe it’s impossible to use Spanish accurately without studying and practicing the language – after two years at the Instituto de Idiomas and doing my homework regularly, my Spanish friends commented on my improved abilities! I must admit I have often felt like telling Krashen where to put his misleading ‘language acquisition’ theories! Or maybe I’ve misunderstood Krashen. Enter my son in 1985 plus the opening of my own little school in 1988 and exit my Spanish language classes! As I have been able to run my very small language school with my limited Spanish I no longer felt the need to return to classes – also, my lack of proficiency in Spanish is sometimes seen as proof that I am actually a ‘native’ speaker! A mother, over the phone, once accused me of being Spanish and non-native! I was very flattered but of course, not good for business! Recently I have had a bit more time and have become more aware of the weaknesses in my Spanish language abilities: speaking with Spanish friends and an English friend who speaks Spanish accurately – these weaknesses have been kindly brought to my attention! Kindly because I have decided I want to improve my Spanish and up to now no one has corrected me – and we all know what a drag it is to try to have a conversation but have to make the effort to correct someone when all you want to do is have a chat and relax! Whenever I go back to the UK I become aware that most Brits would have a hard time passing the B2 exam…it’s amazing how many people never use participles – I’ve observed that they barely exist for many of my fellow Scots: ‘Have you saw that new film?’, ‘I’ve never went there’….and no one is ‘rasgando las vestiduras’ ( you see, once again – some phrases just come to me in Spanish. Is this because my English has not so much fossilized as atrophied? Or is it because some phrases just express a specific idea better?) B ut I digress. The question is what is effective communication? How accurate does language have to be? So, after reading today’s blog, my conclusion so far is that the ability to communicate effectively and accurately is the result of a lot of conscious effort to learn specific language patterns (e.g. irregular verbs) plus a lot of exposure to the language and opportunities to use the language. Also, I suspect, there could be a love of language and curiosity which means that certain patterns ‘te llama la atención’ so that they stick in your mind more. Yes, I have to add as an English teacher who’s spent a long time in Spain – idiomatic English has also become an issue! Anyhow Scott – your blog has made me think a lot! Thanks! Thanks, Lorna, for that fascinating insight into your development as a second language user. It prompts me to suggest that the three ingredients that are necessary for second language acquisition are simply: exposure, study, and use (where use includes feedback). Any two on their own (e.g. exposure and use) don’t work – or work only with certain individuals, or only to a certain limited degree. Your struggle to find a sequence or organising principle for your phrases is the same problem that has existed for syllabus/coursebook writers since the dawn of the communicative approach, and the reason why the grammatical syllabus still rules. This does my head in. I am, however, very encouraged by the way you have chosen to approach it as a learner – having identified your L2 self you have focused the content of your input on what you specifically need to know. I wonder if this is a strategy that we could explicitly focus our learners on in a classroom context – get them to read/listen to/watch language in use based on their individual needs/goals/L2 selves, then select and create their own phrasicons. With regard to actually acquiring the phrases, surely this can only occur through practice. But again this can be done in class through project work – after the receptive phase where phrases are identified, students could produce something (a presentation, an essay, a documentary, a play – whatever) that facilitates the use of the phrases they selected. The class would get to see each other’s projects and make comments, allowing for some peer teaching of language to reinforce learning. Language would be contextualised from the start, and this approach would demonstrate real individualised learning within a group. The focus on specific language needs and preferences would (probably) increase motivation. Hi Steve, yes I totally agree, and this is where a task-based approach and a semantic syllabus consisting of constructions (so as to include not just exemplars but patterns, i.e. chunks AND pineapple) would seem to be a marriage made in heaven. It involves viewing language lexically, yes, but there’s more to it than that. The priority as I see it would be to ensure that the language learned is the language that needs to be learned. It’s important that it comes from the learners and not from anywhere else. you’re working hard, but I imagine you a bit like playing tennis by yourself. If you practice a two minutes talk on linguistics or whatever, there’s nobody on the other side that can tell you: “Well done, Scott, but X doesn´t sound like Spanish, nobody uses an expression like Y”, etc. Definitely, you need a partner to play with. And specially, as Hana points out, if you’re going to allow questions from the public after your talks. Sí, por supuesto, necesito alguien con quien pueda practicar. La búsqueda de la persona más adecuada será el tema de otro ‘blog’. I have witnessed similar problems amongst students who study German as well as English. I don’t know if there is much literature on L3 or even L4 interference. Has this been an obstacle for you? And if so, do you have any strategies to combat it. Thanks for the tip re Quizlet. I’ll check it out. Re conversational fillers: yes, you are right in thinking that these give an illusion of fluency, and I have gathered a few myself. However, the illusion of fluency may in the end be counterproductive:this is suggested by some of the studies of the use of communication strategies (including pause fillers etc) by learners. As Ellis (1994: 403) comments ‘Learners like Schmidt’s  Wes have been found to develop their strategic competence at the apparent expense of their linguistic competence’. Still, as with the use of gesture, the ability to sound (and look) like a fluent speaker might open up more opportunities for practice than if your delivery is painfully slow and halting. Ah, I didn’t know that. Thanks, but yes the second part is also true, as I did get more opportunities to speak with native Spanish speakers, as they were less likely to go to English to accommodate my lack… all rather interesting! Once again, thanks for your contribution – always a joy to read. your post ties in beautifully with a project that I have been piloting for the past few years. It also builds on a ‘phrasicon’ but restricts the selection to high-frequency phrases that routinely happen as part of everyday domestic life between household members, esp. parents and child(ren). We started out with English and so called the project ‘English for parents’, to amplify the potentially instrumental role of mum and dad in its implementation with their kid(s). We have already developed a set of Polish-English materials introducing ‘domestic English’, aimed at Polish parents and their children. And then, surprise surprise, we took on Spanish. In this case it is very much action-in-progress and my own family are the guinea pigs. None of us spoke any Spanish when we started and there were no domestic Spanish study guides so we have to rely on a Spanish teacher friend who has been gradually translating ‘English for parents’ into Spanish for us. This kind of ‘domestic language’ is by definition context-anchored and highly repetitive: ‘Duerme con los angelitos’ can happen naturally, i.e. when it’s needed as part of kiss-goodnight routine, up to 365 times per year! Which is great as it helps fend of the forgetting (sth that you complained about towards the ed of your post)! And also shows that internal grammatical/ lexical complexity (and length!) is not what makes a given chunk difficult, compared to its relative (in)frequency. Once again, thanks a lot for your great entry! Hi Grzegorz (sorry, btw, that you had to post twice: I imagine you thought the first post never made it, but in fact it was sitting in the moderation tray. I’ve now changed the WordPress settings so this doesn’t happen – it happened to Matt, above, too). I’m absolutely fascinated by your ‘project’: I hope you will write it up. I love the idea of ‘domestic Spanish’, and this kind of narrowing of the target domain seems to be under-researched in terms of SLA. The tendency in most teaching approaches and materials is to keep the domain maximally wide (e.g. General English) which means it takes forever to achieve anything like communicative competence in it. Whereas aiming at a more restricted register might confer communicative success sooner. The question then is, how easy would it be to transfer this competence to other domains/registers? I’d like to think it wouldn’t be too hard – a but like learning to drive on the left after first having driven on the right. If you are really looking for a piece of advice on how to reinforce the selected phrases through production, why not have a discussion with a Spanish-speaking linguist / teacher over a controversial topic, e.g. A language course syllabus should be mapped around grammar rules, i.e. something you feel strongly against? This kind of interaction, in my experience, stretches one’s linguistic resources to the utmost and makes the language you use extremely memorable. To focus on those sentence frames and discourse markers you have selected, have a “cardversation” – you pick up a card with a phrase and have to use it, or just have a list of them in front of you and every time you use one, you tick it. And how about reverse translation, with your own books translated by native speakers of Spanish (a suggestion mentioned above)? It is a kind of awareness-raising activity without any heavy metalanguage terminology. Contrastive analysis in action, it might work. What do you think? And there is another very interesting point that came up in the comments – if you say “learning an additional language is about enhancing one’s repertoire of fragments and patterns”, does it mean that one’s own native language starts deviating from the norm ( i.e. “pure” English of someone who has never studied any other language) after learning another language? I mean that your English must have become by now very different from “the monolingual norm” in the choice of structures, lexical chunks and just words because it has been influenced by Spanish. Do you notice such changes in your English? Thank you very much for the post – it has raised a lot of related sub-issues. That’s what happens when you throw a stone into still water and it causes a few rounds of waves. Thanks, Svetlana. Yes, your suggestion as to how to activate my academic phrasicon chimes with my own intuitions. I am now on the hunt for a private teacher who can provide these kinds of practice opportunities. As Beatriz pointed out, I need a ‘tennis partner’! Regarding the effect of Spanish on my L1, Lorna’s post (above) captures this ‘reverse interference’ very nicely. It is fairly well-attested in the literature, but is not something I fear or wish to avoid. I’d rather by plurilingual than monolingual! How to commit the new chunks to memory IS the ten-million-dollar question, I think, and I’m glad you brought it up. The role of memory in second language learning deserves, I think, a little more attention than what it’s been getting in mainstream ELT. Personally, I have found that (incidental) re-exposure to the same chunk in other contexts can sometimes be as effective as output-oriented practice. But that’s me, of course. Hi Luiz – how to commit them to memory, yes. For what it’s worth, there’s a nice book of activities designed for that very purpose by Seth Lindstromberg and Frank Boers: Teaching Chunks of Language: From noticing to remembering (Helbling 2008). I have never studied Spanish but I have picked up (out?) and memorized numerous phrases, often from listening to songs/poems. Like Karenne, I have also learned common conversational fillers. I can and do produce the phrases and fillers fluently and with very good pronunciation. Unfortunately, my efforts have resulted in little if any grammar acquisition, so in conversation in Spanish all I can do is hop from phrasal island to phrasal island. Incidentally, my ability to pronounce my chunks well is more of a curse than a blessing. It misleads Spanish-speakers into thinking I have a good command of the language, with the result that they do not grade their Spanish. Hi Scott, I am really enjoying your new blog. For years now, I’ve got my students to make their own notebooks. I feel it fits perfectly with a teaching unplugged methodology. Thanks for the tip, David. Actually I’m rather fond of my notebooks, which are Italian and have a somewhat retro look (see picture on the ‘Back to School’ post). But I like the idea of crafting my own, too! Sorry, yes, I totally agree. It was more the blank pages that I wanted to emphasise. As a teacher, I started highlighting some phrases of language I was using as I chatted with my students (immediately popping it on the board without interrupting the flow of conversation too much – a technique I picked up from my fantastic DELTA tutor at IH Barcelona – Neil Forrest). Capturing the expressions I used in their natural habitat, often got across the more slippery pragmatic sense of a phrase and the high frequency nature of these chunks of language meant that they often re appeared later in a class. Thanks, Richard – yes, the teacher is (or can be) a hugely rich source of formulaic language, and language which, as you point out, is richly contextualised and often repeated. As I mentioned earlier, one of the first teachers I had when I arrived here peppered her lesson with ‘vamos a ver’ (let’s see now), something I never forgot. The potential for exposure to chunks by the teacher perhaps could be exploited more. I love this simple technique Richard. It reminds me of a student I used to teach who would always take ages to get going with any of the pairwork speaking activities that I set up in class. He’d always be busily writing things down instead of talking to his partner and it used to frustrate me immensely until I found out what he was writing – which was chunks of language that I’d used in giving the instructions. This taught me a lot about the value of my own speech as comprehensible input and the need to give learners opportunities to notice it. Check out Scott Thornbury’s post on the importance of learning phrases. He believes that they “offer a shortcut to fluency, accuracy and idiomaticity”. The sources he cites are also very good, so don’t forget to check the references, too! I am really enjoying this blog! You mentioned, probably in another part, your experiences at Spanish schools. Also Lorna described her experiences at Sevilla University. I have several experiences (I should call them “attempts”) of learning German. Last year I had a few days between two conferences and decided to learn a bit more of German in Vienna. In the first class I could understand only a little –or nothing- but I was having a lot of fun with the teacher trying to make learners follow the exercises of the photocopies and the female learners asking “Was sagt “living together” (in English with a strong accent of the country to where each one belonged) auf Deusch?” and other practical things. In the break I conducted research and discovered that the female students had Austrian boyfriends and were learning German to improve communication with them. The following day I was sent to another class, probably because of my level but most surely because I did not have an Austrian sweetheart, which seemed to be a requirement for that class. New class, new research. There I discovered that the students were trying to learn German in despair so as to get a job. Then, most of them were absent or late for being at/ coming from / going to a job interview. Not much learning in terms of language acquisition but a lot in terms of human contacts. The last day I had my little success with the exam and the speech. My big success was the last evening, for the first time I used the language in the street: to ask a policewoman about the tramway stop and to order the food at the restaurant.